Once an individual has developed the use of lateral thinking, the next step would be to utilize this thinking whenever inspired to design. Design inspiration can come in various forms. Perhaps it’s a client requirement that refers to a particular theme, which leaves a designer to be inspired and research in the given direction. Or sometimes in the case of Spatial Design, factors such as site, demography and ergonomics can induce an area for design inspiration. There are also instances where design inspiration can be completely random and a simple photograph, poem or a material could inspire one to design.Either way, once the design inspiration hits, a designer would naturally research in to this direction, utilizing lateral thinking in the process to generate new directions and ultimately focus on what is regarded as a “Concept”. This means narrowing down the interesting areas of research to develop a concept, noted down either as a simple word, a shorter sentence, or even a smaller poem or quotation. In some instances, the concept could simply be an image or a video, but usually this is again simplified in to a word or two to make the design process easier for the designer. Once a concept is identified, there are many ways in which this can be explored. Usually this exploration varies according to the individual’s style, but also may differ according to the design inspiration. Some would go on to explore the concept further by making use of 2D imagery, identifying shapes from the imagery and developing sketches from it. But in the case of Spatial Design, most would use a more advanced method that utilizes hand-craft and sketch modeling in 3D, building up what is known as a “Concept Model”, which ultimately forms the basis for the Interior or Architectural Design created at the end of the design process. Concept Models, as defined by the name, is a sketch 3-Dimensional model that is based on a single or combined concept. Usually, in a design process, a designer would go on to develop a minimum of 3 concept models according to the direction led by lateral thinking and this number can go up to as many as required. The purpose of a Concept Model, again as defined by the name, is to be able to convey the concept to any viewer as clearly as possible. The best kinds of concept models are those that can easily convey even a complicated concept by a single glance. 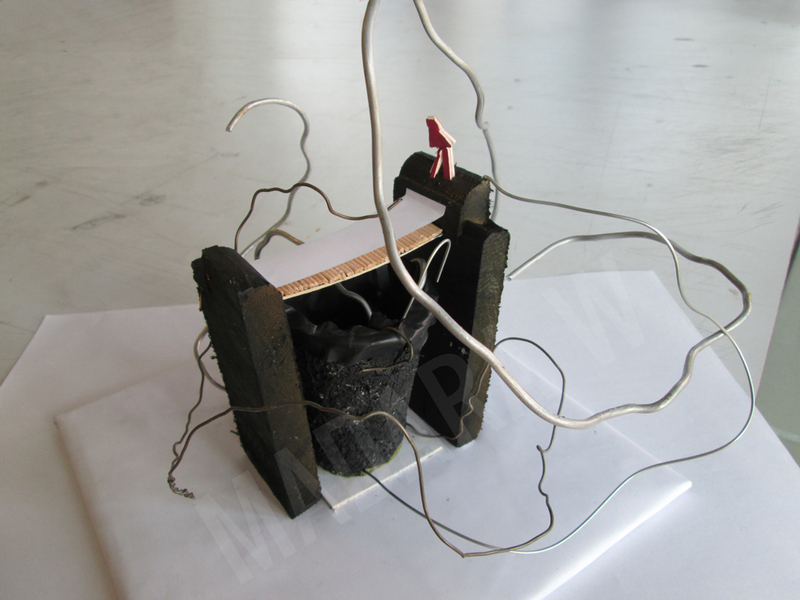 To better understand the use of concept models in Spatial Design, observe the following images. 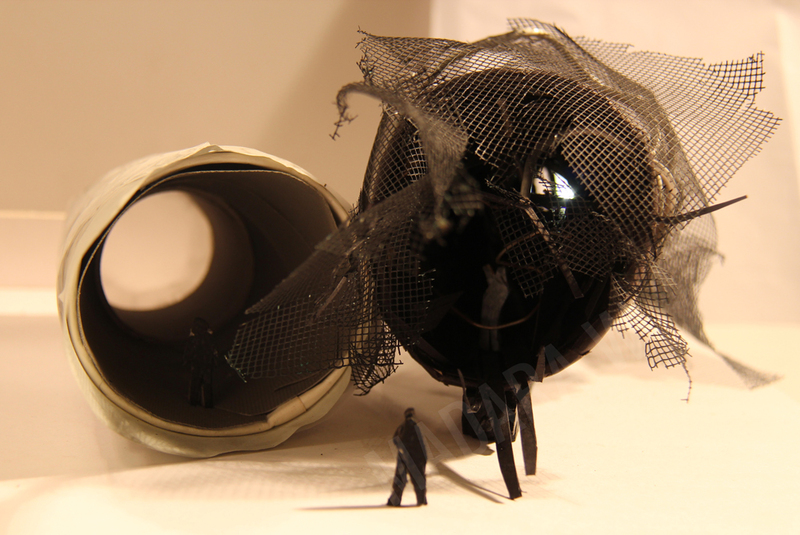 These images represent concept models built by the writer herself, for design projects executed in the past. As the purpose of this article is to comprehend the meaning of concept models and their utilization, the design path that led from these concept models will not be explained. Is it possible to guess the concept behind the following model? At a glance, anybody should be able to realize that the model describes a situation where a person is trying to cross a pathway entangled in a web with a pitfall below. However, with the use of Lateral Thinking, one might expand their thinking to further comprehend that the wired web and the pitfall may represent broader perceptions such as difficulties faced in life, and the notion of insecurity in crossing through it. On careful observation, it can be seen that the immediate pathway seems very delicate with paper being used as a material. However, a much stronger pathway lies exactly beneath it, which is not seen by the person who only sees the top layer from that perspective. This observation further enhances the idea of insecurity shown by the person, who pauses with one leg forwards wondering whether to cross or not, unaware of what the future holds. Overall, this is the concept shown by the designer. To simplify its meaning, it was named as “Leap of Faith”.The next concept model depicts a similar idea conveyed in a different manner. On scrutiny, it can be recognized that there are two pathways, one seemingly darker with obstructions and the other lighter and clearer. The darker pathway is seemingly longer and further away with the end shown in a smaller but brighter light. The lighter pathway is seemingly shorter and closer with the end shown in a larger but feeble light. On closer inspection, one would notice that the brighter light is brought about by an opening at the end, whereas the feeble light is brought through a transparent material. By the use of Lateral Thinking this was meant to induce the difference between an easier yet fake pathway; much like those faced in real life, and the ones which are real yet difficult to achieve. The person who stands in between is meant to represent the tough choice faced in such a situation. The concept was thus named, “Struggle”.Likewise, it is possible to grasp what Concept Models are and how they can be built upon, relevant to an area of design research or / and inspiration. The next stage is to utilize these concept models to derive shapes and to further exploit these shapes through sketches, in order to arrive at a Spatial Model that can be developed into a final building design which retains the essence of the key concept. Madara is a contributor at Nerdynaut.